NAMIE, FUKUSHIMA PREF. 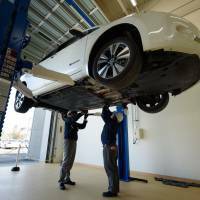 - At a small plant intended to help revitalize a town ravaged by the 2011 earthquake, Nissan Motor Co. is giving its costly electric vehicle (EV) batteries a new lease on life after they pass their peak performance. Global automakers are looking for ways to make cheaper EVs and prolong the life of their batteries, which can account for up to one-fifth of each vehicle’s cost and are made from increasingly costly materials including cobalt and nickel. 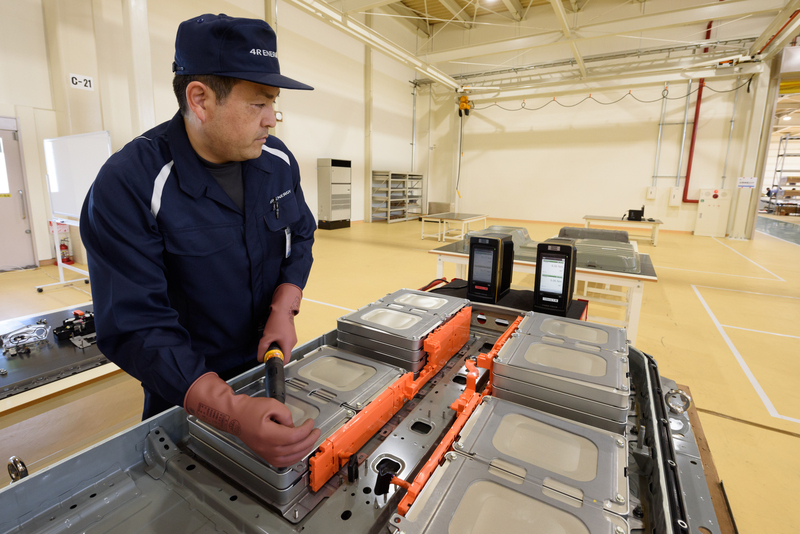 Starting in May, 4R Energy Corp., a joint venture between Nissan and Sumitomo Corp., will begin selling rebuilt replacement lithium-ion batteries for the first-generation Leaf. 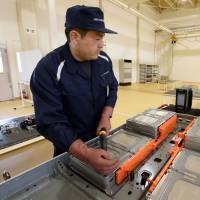 The batteries will be produced at the new factory in Namie, Fukushima Prefecture, by reassembling high-performing modules removed from batteries whose overall energy capacity has fallen below 80 percent. They will be sold in Japan for ¥300,000 ($2,855.51), roughly half the price of brand-new replacement batteries for the world’s first and best-selling mass-marketed all-battery EV. “By reusing spent EV batteries, we wanted to raise the (residual) value of EVs and make them more accessible,” said Eiji Makino, CEO of 4R, which on Monday opened the plant in Namie — around 5 kilometers north of the site of the Fukushima nuclear disaster, the world’s worst since Chernobyl in 1986. 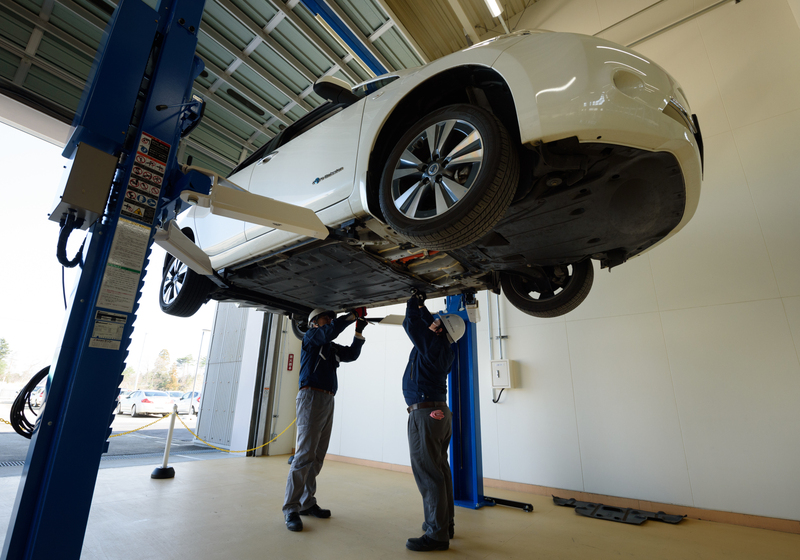 Sumitomo has come up with a way to analyze all 48 modules contained in each battery pack within four hours, a huge time savings from the 16 days Nissan engineers previously required for similar measurements. Modules with capacities above 80 percent are assigned for use in replacement Leaf batteries; less capable modules are reassembled and sold as batteries for fork lifts, golf carts, and lower-energy applications such as street lamps. The plant can process 2,250 battery packs a year, and initially plans to re-fabricate “a few hundred” units annually, Makino said, adding that 4R would be looking to see whether the same process could also be used for batteries from the latest Leaf model, which uses a different battery chemistry. Bracing for a sharp increase in the price of key EV battery materials — which include cobalt, nickel, and lithium — more automakers are focusing on reuse and recycling. Toyota Motor Corp. announced in January it would partner with a Japanese electric power company to explore similar options. Makino said it would be difficult for 4R to completely break down and recycle EV batteries on its own but that the firm may consider partnering with another company to retrieve reusable materials — a process industry experts say is key to sustainable EV battery production. “Second use is potentially a really great option, but at the end of it all, batteries still need to be recycled,” said Jeff Spangenberger, energy systems researcher at the U.S. Argonne National Laboratory, adding that the profitability of battery recycling operations would depend on the highly volatile price of component materials.